The UT Police today unearthed a liquor smuggling racket in which the accused adopted a unique way to escape the police eye. The accused liquor contractor modified his truck in a way that there was double flooring in the truck and an automatic hydraulic jack was installed to pull one part of the floor with all the liquor boxes hidden beneath the flooring. 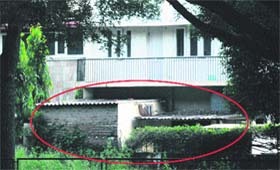 A Punjab Civil Services (PCS) officer, Rahul Gupta, currently posted as the UT Assistant Estate Officer, a public dealing post, seems to have devised a unique way to keep away from the public. 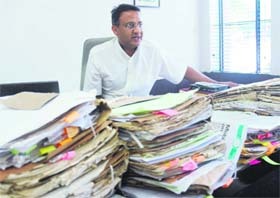 Post-lunch, he shifts his office to the Sukhna Lake Sports Club as he also holds the charge of Director Sports in addition to six other posts. Are the UT Administration-run government colleges losing their sheen? Unlike in the past when government colleges were the first port of destination for students graduating from school, this year the scene appears to be different. To save vehicle owners from the hassle of queuing up at the office of the Registration and Licensing Authority (RLA), the Punjab Transport Department has introduced a new arrangement to allow vehicle dealers in Mohali district to register non-commercial vehicles. Four girls in their early 20s, who were returning home in a cab from a disco in Sector 9, became a victim of eve-teasing when they were chased and harassed by four youths in an SUV late last night. The PGI inquiry committee formed to look into the death of Ghinder Singh, a 55-year-old resident of Doraha in Ludhiana district, found nothing wrong with equipment as well as the working of the doctor attending the patient. A private contractor engaged by the municipal corporation (MC) to carry out development work at Attawa village is costing the civic body dear. 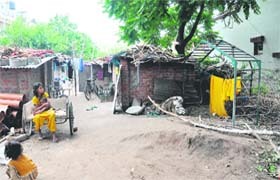 A park, developed at a cost of lakhs of rupees by the MC for residents of the area, is being used as a store and a site to dump construction material by the contractor. Punjab Governor and UT Administrator Shivraj V Patil today asked the officials concerned to ensure transparency in the Public Distribution System. He said each and every consumer should get ration from fair price shops without any inconvenience. In a special anti-encroachment drive, the municipal corporation today lifted 22 cars, five three-wheelers, three Tata trucks, one recovery van and 17 dumped vehicles from the Phirni road of Burail village here today. The online retail industry in India is likely to be worth Rs 7,000 crore by 2015 due to easy availability of broadband services and increasing Internet penetration across the country, apex industry body ASSOCHAM said here today. The haphazard preparation of the draft electoral rolls (special revision) relating to the Phase XI area here has created confusion among residents. In many cases in the poll rolls, with the date of publication given as January 5, 2011, the numbers of houses and the names of members of the families concerned are scattered. Newly erected traffic lights here, which are not working properly, have led to a chaotic situation in the area as commuters are facing confusion and a lot of inconvenience due to these lights. In view of the ensuing monsoon, the health department has geared up to combat the spread of vector-borne diseases such as dengue, malaria and Japanese Encephalitis in the district. To streamline the management and facilitation of healthcare facilities to the Armed Forces veterans, polyclinics operating under the Ex-servicemen’s Contributory Heath Scheme (ECHS) are being automated. 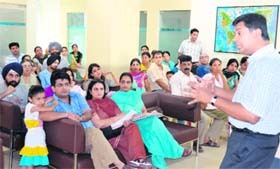 Medical research at the PGI is all set to get a boost with residents pledging to donate their bodies in large numbers. Till now, 1,118 persons have pledged their bodies for research in the PGI. The BJP today organised a padyatra in Ward No. 17 to make the general public aware of corrupt means adopted and mal-administration of the Congress and its leaders. “Celiac disease is an auto-immune disorder that damages small intestine and requires children to follow strict, gluten free diet,” stated Dr Raj Setty, director, Childrens Hospital, Panchkula. A chemist of RK Medicose, Sector 23, was issued notice under the Drug and Cosmetics Act for selling capsules of spasmo proxyvon, listed as Schedule H drug. The sale of drug is allowed with prescription of a physician only. The Chandigarh Municipal Corporation’s Medical Officer of Health has constituted special teams to check the outbreak of diseases in the city. Two mobile teams have been constituted to conduct inspections during evening hours. On the last day of submitting admission forms in various departments at Panjab University, a surprise check was conducted by the Vice-Chancellor RC Sobti at the enquiry block (Aruna Ranjit Chandra Hall) today. 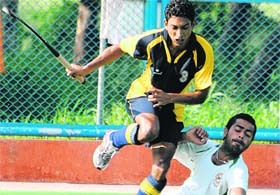 Local sportspersons were a harried lot today during the ongoing BCom centralised admissions after they were denied admission against sports quota seats by the Panjab University authorities, instead of being in the merit list. With an unexpected increase in the cut off for BCom in the centralised counselling being conducted by Panjab University this year, several applicants, who had filled in only two or three colleges in their forms are now facing a harrowing time. These students, who could not make it to the top two colleges, had not filled in any other option in forms. More than 20 girls studying in BA-BEd integrated course at Panjab University today expressed resentment over the long-pending affiliation issue of their course. The girls demanded that the students, who had completed the course, be permitted enrolment in other courses at PU on the basis of this degree, which was currently being denied. 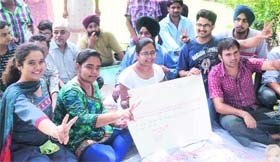 Acting on the complaint of over 70 applicants, who could not register themselves for counselling and whose parents had been protesting on the premises of PEC University of Technology for the past four days, the Joint Admission Committee (JAC), constituted by the UT administration, today gave a verdict in favour of students. A truck loaded with vegetables overturned on the national highway at Bhankarpur near here this morning injuring three persons. 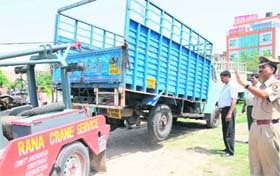 The truck was moving from Shimla to Delhi when its tyre burst around 4 am near here. The police today claimed to have solved a murder case with the arrest of two persons. Police officials said the body of an unidentified woman was found on Saturday near the cremation ground here. Shopkeepers in the town did not respond to the call given by the ruling SAD -BJP alliance in protest against the hike in prices of diesel, petrol, kerosene and cooking gas by the Union government. For the first time, development works worth Rs 70 lakh has been approved in the Dera Bassi Municipal Council. The approval had come under Section 234 of the Punjab Municipal Act, 1911, bringing relief to residents who have been awaiting development in the area for the past two years. 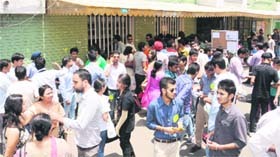 More than 85 per cent seats have been filled during the first round of counselling at the Chandigarh Polytechnic College, Gharuan. In a press note issued here today, chairman Satnam Singh Sandhu said computer science branch was the most preferred branch in the college. A petition filed by 14 lawyers allegedly involved in the Sector 17 district court clash on May 14 today failed to find favour with the Punjab and Haryana High Court and has been dismissed as withdrawn. 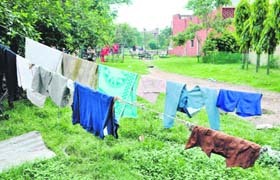 The estate office seems to have toughened its stand against building violations in the city with serving at least 350 notices to violators, residing along Udyog Path (the main road leading from Inter-State Bus Stand, Sector 17 to Industrial Area), here. The estate office came down heavily on a house in Sector 22 for violating norms here today. 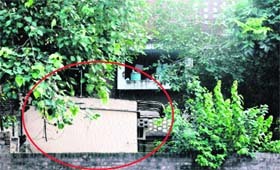 A team led by Ravinder Sharma, inspector (misuse and enforcement), inspected house number 1663, where the house owner has constructed a room in the backyard of the house. A 25-year-old labourer died while another got seriously injured when they came under a train at the railway track near Ram Darbar here this morning. Mohammad Arshad, who hails from UP, died on the spot, while Inam Ali was seriously injured after they came under the wheels of Janshatabdi Express. 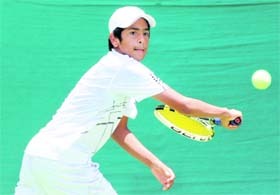 Local player Sachin Kumar thrashed Harshit Sharma of Delhi in the boy’s (U-14) category during the match of the CLTA-AITA National Series Tennis Tournament for Boys and Girls (U-14 and U-16) being held at CLTA Complex and Lake Sports Complex here today. Maintenance Command (MC) got the better of Air Headquarters (Air HQ) by 5-2 to pocket the title of the Air Force Hockey Championship, which concluded on the 3BRD Air Force Station astroturf ground here today. Aneesh Saini outshone Divya Sharma in the final of the 25th Haryana State Sub-Junior, Junior and Senior Billiards and Snooker Championship today. Aneesh beat Divya by 4-3. 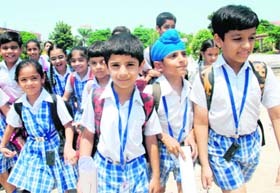 The Chandigarh sports department will organise a swimming competition under the sub-junior and junior category of boys and girls at the all-weather swimming pool, Sector 23, from July 6 to 8 here.